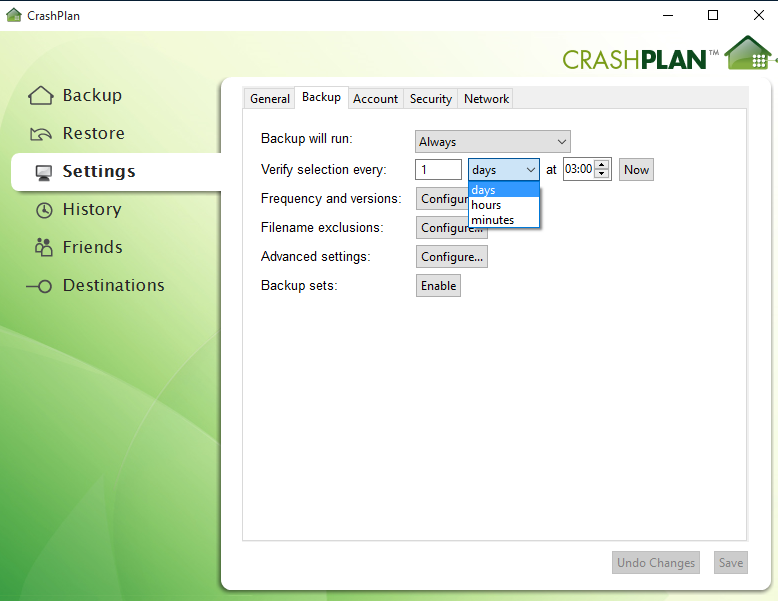 CrashPlan review, exploring the pricing, features, and security of this backup service, and its strengths and weaknesses as a data storage solution. With unlimited storage space and strong features available at a reasonable price, CrashPlan is a smart choice for any online backup user. A free plan offering local backups is a big plus, and great security and easy-to-use software make it an accessible and appealing backup solution. You can read a detailed review below or sign up now. CrashPlan offers three different price plans – Free, Individual subscription and Family subscription. All provide unlimited backups to local computers and drives and external computers and drives while subscribers also receive full access to CrashPlan Central. Free users get 30 days of online storage, and their use of other features is free from time constraints. Individual subscription covers just one computer and costs $5.99 per month, or $59.99 for a year, and payment is accepted from all major credit cards. Subscribers have access to additional customer support, mobile file access, unlimited versioning and 448-bit encryption – as well as unlimited cloud storage and online access. Family subscription has all the same features as the Individual plan, but can cover anything from 2 to 10 computers. It costs $13.99 per month, or $149.99 for a year. CrashPlan holds up pretty well against its competitors so far as pricing is concerned, with other industry giants such as Backblaze and Carbonite also offering unlimited storage at similar prices. Given that CrashPlan lets you backup to not only the Cloud but also local and remote devices, however, it seems that they’re offering quite a lot of bang for your buck. Are you looking for a way to protect your data in case of tech-based disaster? Trying to find software that will keep the Cloud constantly backed up with the latest versions of your files? Then online backup is the best choice for you. File sharing is a bit thin on the ground, and you can often only register a single device, but unlimited storage space means you can relax in the knowledge that all of your files are safe, no matter what. CrashPlan was first released in 2007 by Minneapolis-based company Code42 and now processes over 100 billion files every day. Currently headed by CEO Joe Payne, Code42 focuses on creating practical software with every-day applications, and now employs over 400 people. Although the majority of their revenue comes from subscribers to their CrashPlan Business system, they have also invested considerable resources in developing their personal plans. While some backup services only allow certain types of files to be uploaded, there’s no restriction on the type of files you can store with CrashPlan and no cap on their size. This makes it a particularly good option if you have a lot of large video files or similar, although it’s worth noting that very large items will take longer to backup. Crashplan doesn’t require you to manually back things up as you go along, as is the case with external hard drives and several other cloud storage services. Instead, the process can be entirely automated, allowing you to schedule your backups (almost) as frequently as you like. If you opt for the free version, you won’t be able to backup more than once per day, while subscribers can set the program to run continuously. So if you’re creating a lot of content and are worried about losing something crucial, CrashPlan is a great way to put your mind at rest. As mentioned above, CrashPlan offers both Individual and Family packages. While the Individual subscription only covers one computer (which can be tricky if you own multiple devices), the Family subscription is a cost-effective way to accommodate multiple users. With a generous allowance of up to ten computers that can be tied to one account, it’s an excellent deal for larger households or people working from multiple laptops and tablets. One of CrashPlan’s stand-out features is its compatibility across platforms, as both free and subscription versions are compatible with not just Windows and Mac, but also Linux and Solaris. Code42 also offer a free mobile app to subscribers, which can be used with Android, iOS and Windows phones, and allows users to access backed up files from mobile devices on the go. 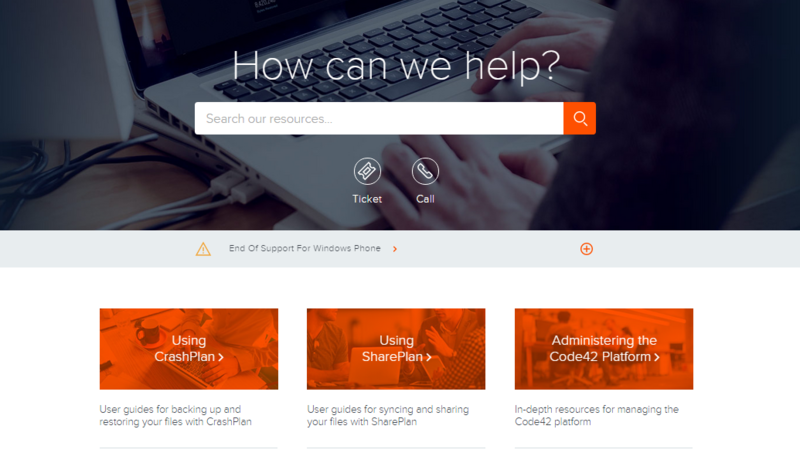 Code42 used to offer a CrashPlan sync and share service in the form of their SharePlan app but have recently decided to withdraw from the market. This now leaves them without any integrated file sharing options. We calculated CrashPlan’s upload and download speeds by doing a couple of test runs with different file sizes and tracking the time manually. We then worked out exactly how many MB were in each file, and divided that number by how many seconds it took to upload or download. We recorded our findings in the graph below. 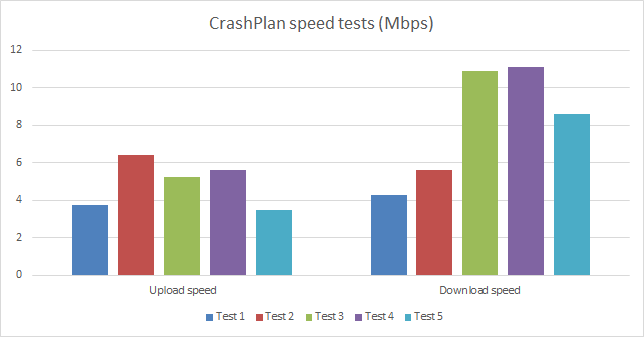 For the most part, CrashPlan’s uploads were pretty quick, with an average speed of 4.9 Mbps and a 100MB file taking just over two minutes to upload. We did experience a slight setback during one backup, when the upload paused and we were informed that CrashPlan was “waiting for a connection” – although there were no discernible problems with the internet on our end. This added another two or three minutes to one of our uploads, although all of the others were unaffected. Download speeds were very good as well – considerably above those offered by most other providers. A 100MB file took one minute and 15 seconds to download, and CrashPlan averaged a rate of 8.1 Mbps. It’s always a good idea to have your files backed up in multiple locations, and Code42 go out of their way to ensure that CrashPlan customers have a variety of different ways to backup their data. You can choose to save to a local drive (typically your own removable hard drive), a remote computer belonging to a friend, family member or colleague (your files will be encrypted, so no need to worry about invasions of privacy) or online to CrashPlan Central. You can of course also combine all three for the ultimate in protection. Code42 also offer backup sets, which allow you to save the same files in multiple different locations – helping to keep things organised and as well as adding an extra level of security. Casually deleting a document that you think you’ll never need again can be a risky business, as now and then you’ll face an urgent need for a long-forgotten piece of information. You’ll have no such problems with CrashPlan, however, as they retain all deleted files. If you want to get rid of something for good, however, never fear – you can turn this system on and off. File versioning is a process that allows you to store multiple versions of the same file over time. When you backup a file, rather than overriding the previously saved version, CrashPlan will store it. You’ll still keep working on the most up-to-date content, but you can also retrieve earlier saves if you need them. Although many companies offer this service, most limit the time that you can keep archived versions for – sometimes to as little as 30 days. With CrashPlan, there’s no limit – you can make as many versions as you like, and keep them indefinitely. Code42 also offer two additional file restoration options, which can be purchased for an additional fee. One common complaint levelled at CrashPlan is that initial backups can be slow – and by slow, we mean weeks or even months. If you’re keen to get a speedier option and don’t mind a price tag of $129.99, then CrashPlan now offers Seeded Backup. This is an optional extra that provides an alternative way of performing your first backup while avoiding inconveniently slow upload speeds. Code42 will ship you an external hard drive, which you can fill with up to 1TB of data, and send back – they will then upload your files to CrashPlan Central for you. You can continue to add new files as normal, safe in the knowledge that a large chunk of your data is now securely backed up online. For those fed up of waiting around this could be a useful shortcut, but it’s still a limited service. At the moment, it’s only available to customers in the US, or members of the US Armed Forces serving abroad, and you can only use the service once per computer. There’s also a strict capacity limit, so you’ll have to backup anything over the 1TB allowance yourself. It’s also worth noting that the speed of your initial upload will vary considerably depending on your bandwidth allowance. So given the time it takes to ship the hard drive back and forth, you may not find a very significant difference in the processing times. Best for backups exceeding 300GB, the Seeded Backup requires that you’re subscribed to CrashPlan, and takes 3 to 5 business days to ship. 2016 Update: As of January 4th 2016, this service has been discontinued due to ‘declining interest’. Restore-to-Door is another optional addition although, unlike Seeded Backup, this service can be used at any time. Promoted for use in emergency situations, Restore Door-to-Door is a quick way to get an offline copy of your files. Just pay the one-off fee of $164.99 and Code42 will send you a physical hard drive containing your CrashPlan Central backup, letting you access your data even if you can’t get online. With the feature now discontinued, CrashPlan recommends using their offline backup service to save an additional copy of your data to an external hard drive or another computer. This should allow you to access your files if restoring them from the Cloud is too time-consuming or difficult to achieve, as well as increasing the security of your files by creating an additional copy. CrashPlan takes its security seriously, offering multiple layers of protection for your files. All data is protected by end-to-end encryption, with subscribers getting an impressive 448-bit key, while free users are provided with standard 128-bit. Keys are securely made using a random number generation system, and can be replaced with one of your own if you prefer. For those using Cloud storage, CrashPlan Central’s data centres are also protected against fire and power failure, and are climate controlled and monitored around the clock. In addition to this, all CrashPlan users have the option to set a private encryption key, which is generated from a password that is never seen or saved by CrashPlan in its plaintext form. It is also impossible to retrieve or reset this password should you lose or forget it, meaning that the responsibility for accessing your data is all in your hands. The major advantage of this system is that there is no way for the company to decrypt your files, so you can feel safe in the knowledge that your data is private. The CrashPlan website is a little tricky to navigate, but it contains an impressive amount of information – with videos, tutorials and user guides available on wide range of topics. Information is clear and concise, and helpful whether you’re new to the software or just trying to troubleshoot. Subscribers have access to a broader range of customer support services than free users, although tutorials are available to everyone, and there are helpful support forums on offer too. Paying customers will also receive priority support and free upgrades (with a yearly subscription only). Requests for help can be submitted by using a ticket, which Code42’s customer support team, known as the ‘Customer Champions’, monitor 24 hours a day. You can also contact the Champions by phone although this may not be much help to overseas users as both their US and international numbers only operate between 9 am and 5 pm, US Central Time. Public reviews of CrashPlan’s customer service are largely positive, citing fast response times and helpful information, as a result of which their support team currently boasts a 97% customer satisfaction rating. They also guarantee 100% human interaction, so no automated responses here. The CrashPlan Twitter account is regularly updated with company and industry-wide news, as well as giving customers the chance to get their questions answered online. Code42 also maintain a blog and Facebook page, both keeping readers up to date with tech news and hints and tips for data backup and protection. We submitted a ticket via the CrashPlan website and received a friendly and informative reply after eight hours. It’s not the fastest response time (especially as they don’t have a live chat feature), but the response definitely wasn’t automated and gave us all the information we were looking for. You can download the CrashPlan software from their website with just a click. The 49.1MB client takes just a few minutes to install, and is extremely easy to use – with clear, friendly language and carefully signposted instructions. Once installed, you’ll be asked to create an account, which is another straightforward process. You won’t need to give much by way of personal information (just your name and email address), and your bank details are not required if you’re just opting for the free service. As soon as you’ve registered, CrashPlan is ready to go, and will start backing up your files immediately – although this process can be paused if you want to wait a while or change your settings first. The program is jargon-free, well organised and very easy to navigate, with a row of tabs along its left-hand side that clearly indicate your options. From the main Backup screen, you can select which files you want to backup, and where you want them to be stored. You can choose between CrashPlan Central (if you’re a subscriber or using the 30-day trial), a friend’s computer, an external hard drive or even just a backup folder on your own PC. Navigating the program’s other options is easy too. The Settings tab is the place for you to decide exactly how to make CrashPlan work for you – letting you create backup sets, select storage locations and determine the frequency with which your backup takes place. The Restore tab is the place to retrieve backed up files – a process made easy by a good search function and a simple interface. You can also rename files here, and choose which versions you want to access. The History tab gives you an overview of what CrashPlan has been up to – allowing you to check when your last backup was performed, and clicking on ‘Friends’ lets you link up with external computers that you want to backup to. Finally, the Destinations tab walks you gently through the process of backing up to different locations, with simple, easy to follow instructions. 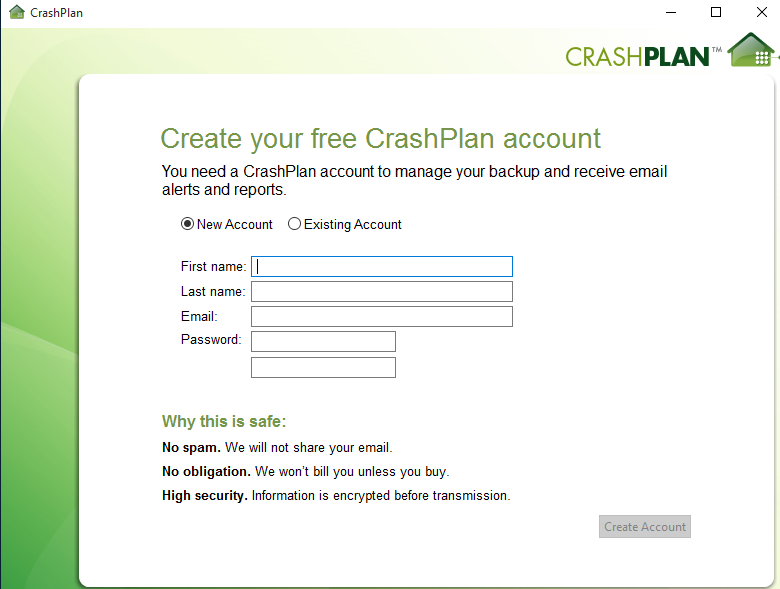 If you want to access your files online, all you need to do is log into the CrashPlan website. Once again, everything is clear and easy to understand, and you can quickly access the files stored in CrashPlan Central. CrashPlan’s application for mobile users is available to download from Amazon, iTunes and Google Play, and is compatible with Android, iOS and Windows Phone operating systems. Its features are very limited – only allowing users to browse and download their files – but these simple processes are simple and easy to use, and there are no restrictions on how many files can be downloaded. CrashPlan is a very effective service – simple and easy to use, with clear instructions that make it accessible to even the most inexperienced user. At the same time, it also boasts a range of features that allow more experienced customers to customise the software to best meet their needs.With unlimited capacity, strong security and the option to save to both online and offline storage locations, CrashPlan ticks many of the boxes for backup solutions. It has also avoided some of the disadvantages of online data storage with the innovative, if pricey, Seeded Backup service, although you’ll still need to look elsewhere if you want to share your files online. CrashPlan’s compatibility with a wide range of different platforms also puts it at an advantage over its competitors, and this combined with its flexibility and ease of use place it firmly at the top of the pile. Hi, having used Crashplan for over 2 years. I think it was one of the best and most comprehensive backup systems out there – lately though been using Backblaze. Why? If you consider Crashplan, over time you’ll need some technical skills. If you don’t regularly look into the status reports it may just continue not backing up. E.g. you’ll need to reset cache from a command line. Also, their settings are not very user friendly. Just can’t get an answer. Quite unbelievable and in my opinion unforgivable when its my backup at risk. Because of this I didn’t renew my plan with the result that not even my local backups to my external drive, which should be free, are working. Thanks very much for your comment Jens, we really appreciate your thoughts. Unfortunately, the link you included in your original post doesn’t seem to be working – please do send us an updated version if you get the chance.